Google map of all worthwhile climbs in the Pyrenees! The rules for the +1000m climbs are not 100% perfectly followed, but the idea is to choose the most logical starting point and end the climb when there is more gravel than asphalt, or normally just where there asphalt ends (a couple of the climbs are well worth to proceed a bit further on gravel, depending on the weather). Mostly I start the climb at least from the second way out of the area on another road, but all depending on whether there is any substantial height gain still possible by starting lower. Generally the climbs should be at least 4% on average, but currently a few have been added just below, like Passo della Mauria and Col d’Ornon (they might be removed later). I (mostly) only state the height metres for the recommended climb, but sometimes not as it might be less than 1000m up, while another climb variation means +1000m and have then chosen the longer climb. Some short gravel is tolerated, but there are borderline cases in less than maybe 5 cases where I have not yet verified by visiting them myself. Normally when there is a kilometre or more of gravel and I still think one should climb to a gravel end, I have added them to the Gravel climbs section at the end. Gerlitzen have like a kilometre of gravel at the end, but there is not much point doing that climb unless one goes to the top, so included that as “asphalted”. Climbs that fork off from eachother on the way up have to be separated by at least over 200m height gain from the the fork. Climbs to another place below another climb even if still 1000m gain are not included (as they will normally have the same view at the end, only form a lower point). ALL climbs mean climbs with different end points. Many of the climbs have 2 or more sides/variants that are all have +1000m gain, but the interest here was to locate the places, then you choose the sides and can come back another time to climb another variant. My first book is still available! 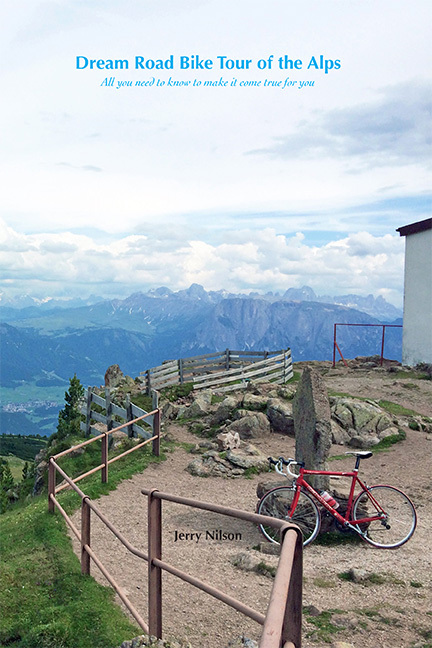 Giving all the advice needed to make a memorable bicycle tour of the Alps. I also illustrate such a tour by creating a “dream tour” – attempting to solve the puzzle of what route would be optimal to take if you only go to the Alps once and got +2 weeks at your disposal. That tour I could both illustrate and comment on in detail even if I have never done it myself, since I have been to (nearly) all the roads and places before. 2016-01-15: The book is now also available worldwide through all bookstores online and normal ones that order it for their customers. It is available from Amazon.com ; Amazon.co.uk ; Adlibris.com ; and more as of writing. The book is still possible to order from Blurb too! 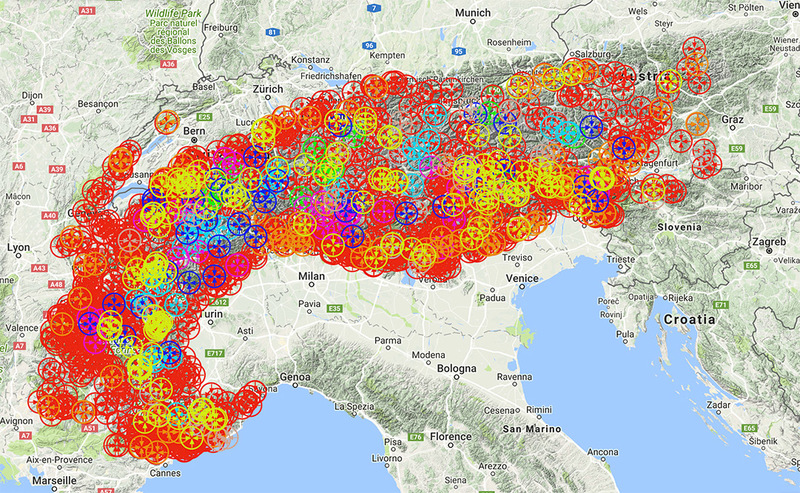 2019-02-23 NEW Google map with of my 125 favourite climbs in the Alps. 2019-02-10 NEW Google map of all worthwhile climbs in the Pyrenees! 2018-01-29 Tour of the Pyrenees 2017 up now (or a week ago). 2017-11-16 Friuli Spring 2017 tour up now. 2017-09-20 Pass list for the Pyrenees updated, descriptions remains to be done. 2017-03-22 Finished the writing of the story for the Tour of the Alps 2014. Only the Spring tours 2012, 2013, 2014, 2015 stories left to write down now. 2017-02-25 Finally finished the writing of the story for the Tour of the Alps 2012. 2016-12-18 Spring tour 2016 (Nove Colli etc) up now. 2016-10-26 Tour of the Alps 2016 up now. 2016-07-21 Finished climbing all paved Alps passes from 1392m and higher and modified the high Alps pass lists accordingly. Followed later by many corrections esp. on the French passes.